Minimum 10 Rulers Or Templates Capacity. 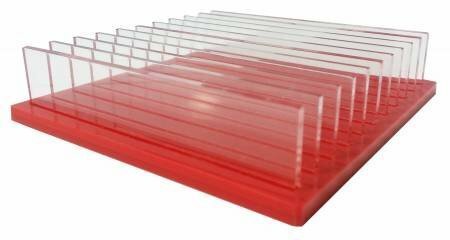 The Rack Comes With A Colored Acrylic Base And Clear Separators. Base Is About 5 X 5, Stands About 1-1/8in Tall. Slats To Hold Rulers/Templates Are About 7-1/4in Wide.